In sketch mode, the Draw panel tools of the Family Editor are used to create profiles that are extruded or blended with other profiles, thereby forming a shape. Outside of the sketch mode, profiles created from model and symbolic lines are used to create 2D or 3D representation of components. 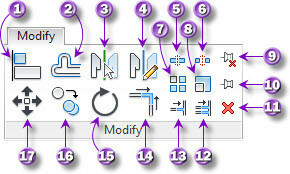 On the other hand, the Modify panel contains tools for manipulating and editing components. In sketch mode, they enable sketching and placing of profile elements quickly and accurately. Using the powerful modifying tools, components can be copied, duplicated, moved and placed in precise locations. Using any of the Forms tools, all components in a model start with a profile that's sketched with the Draw panel tools while in sketch mode (see Figure 1). Figure 1. The Draw panel tools. 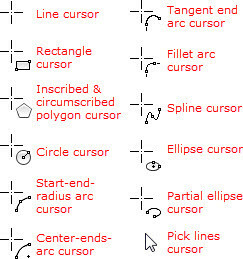 The tool icons and the cursor that display after clicking a Draw button provide a clue as to what type of shape they generate (see Figure 2). Figure 2. Tool icons and cursors. To understand how the Draw panel tools work, open the Generic Model template and select the Extrusion tool (Create > Forms). In the sketch mode, draw shapes using the tools described below. Line: This tool creates a straight line or a chain of line segments connected to one another. A listening dimension value can be typed after the first click. Lines can be drawn offset from their locations. The corners can also be rounded with arcs as the lines are being sketched by specifying a value in the radius box (see Figure 3). Figure 3. Corners can be rounded while creating lines. Rectangle: This tool creates a rectangle by clicking two points opposite one another. As the cursor is moved, the temporary dimensions display the length and width. Rectangles can also be drawn offset from their locations. The corners can also be rounded with arcs by specifying a value in the radius box (see Figure 4). Figure 4. Rectangles can be created with round corners. Inscribed Polygon: This tool creates a polygon based on the number of sides specified in the Sides box of the Options bar. The first click establishes the center of the polygon. As the cursor is moved, a preview of the polygon appears while it is being dragged at its vertex points (see Figure 5). The polygon can be rotated as the cursor is dragged. The second click creates the polygon. A listening dimension value can be entered after the first click. Alternatively, a value can be entered in the Radius portion of the Options bar. Figure 5. A polygon dragged from its vertex points. Circumscribed Polygon: This tool creates a polygon based on the number of sides specified in the Sides box of the Options bar. The first click establishes the center of the polygon. As the cursor is moved, a preview of the polygon appears as it is being dragged from its side (see Figure 6). The polygon can be rotated as the cursor is dragged. A listening dimension value can be entered after the first click. Alternatively, a value can be entered in the Radius option of the Options bar. Figure 6. A polygon dragged from its side. Circle: This tool creates a circle by clicking two points. The first click establishes the center point. The second click creates the circle (see Figure 7). Figure 7. How to create a circle. Spline: This tool generates a smooth curve (see Figure 8, A) by clicking a series of control points. Each click establishes a control point. After the first click, a line displays with the cursor as it is moved. Clicking a second point turns the line into a curve as you click the cursor on the subsequent control points. 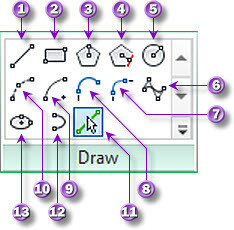 Double-clicking the last point ends the drawing process and keeps the tool active. To exit completely, press the Esc key twice or double-click a blank area. When the Chain option is selected from the Options bar, double-clicking ends the drawing process and starts a new spline from the last point of the previous spline. Selecting a spline (see Figure 8, B) displays its control point and adds an Edit Spline panel to the contextual menu. This panel also contains buttons for adding and deleting control points. Figure 8. Creating a spline. Fillet Arc: This tool rounds the corners of two intersecting lines or arcs. This is done by selecting two elements with the tool (two clicks) and dragging the preview of the arc to the desired location. A third click creates the fillet. A listening dimension value can also be entered instead of a third click. Alternatively, the radius can be specified in the Radius box of the Options bar before selecting two elements. The radius of the arc can be edited by entering a value over the temporary dimensions (see Figure 9, A) or dragging the middle drag control (see Figure 9, B). Figure 9. Creating a fillet arc. Tangent End Arc: This tool creates a curve from the end point of an existing line or curve. The generated curve shares a common tangent shape with the element from which it is connected (see Figure 10). Subsequent clicks produce a series of curves tangent to one another. Figure 10. Creating a fillet arc. Center-Ends Arc: This tool creates an arc by clicking three points. The first click establishes the arc’s center point (see Figure 11, A). Moving the cursor to a new location and clicking a second point establishes the length of the radius (see Figure 11, B). A listening dimension value can also be typed instead of a second click. Clicking a third point at the desired location creates the arc and displays temporary dimensions (see Figure 11, C). Figure 11. Creating an arc with the Center-Ends Arc tool. Start-End-Radius Arc: This tool creates an arc by clicking three points. The first click establishes the start point (see Figure 12, A), while the second click establishes the end point (see Figure 12, B). A listening dimension value can also be typed instead of a second click. As the cursor is moved, a preview of the arc displays with the cursor. Clicking a third point at the desired location creates the arc (see Figure 12, C). Figure 12. Creating an arc with the Start-End-Radius Arc tool. Pick Lines: This tool creates a line or curve based on an existing edge. It copies or traces the edge of an existing element on which it is clicked (see Figure 13). These elements are model lines, reference lines, reference planes or the edges of solid and void extrusions. Figure 13. Tracing an underlay using the Pick Lines tool. Partial Ellipse: This tool creates half of an ellipse by clicking three points. The first click establishes the first vertex. A preview of a half ellipse displays with the cursor as it is moved and clicked to a second point to establish the length of the major axis. A listening dimension value can also be typed instead of a second click. Again, a preview of a half ellipse displays with the cursor as it is moved and clicked to a third point to establish the minor axis that makes up the completed partial ellipse. A listening dimension value can also be entered instead of a third click. Ellipse: This tool creates a full ellipse by clicking three points. The first click establishes the center point. A preview of a full ellipse displays with the cursor as it is moved and clicked to a second point to establish the length of the major axis. A listening dimension value can also be entered instead of a second click. Again, a preview of a full ellipse displays with the cursor as it is moved and clicked to a third point to establish the length of the minor axis. A listening dimension value can also be entered instead of a third click. In a complex family, assembling and putting parts together are made easier with the Modify tools (see Figure 14). Figure 14. The Modify panel tools. Note: the letters in parentheses after the name of the tool are the default keyboard shortcuts. Align (AL): This tool is used to align an element or multiple elements to a selected element. In the family environment, it is generally used to align and lock elements to reference planes. To use it, you first select the element or reference plane where you want the object to align to. Next, click the second object. Offset (OF): This tool copies or moves an element at a specified distance entered in the Offset box in the Options bar. The offset can also be done interactively by selecting the Graphical button option. Mirror-Pick Axis (MM): This tool mirrors a copy or duplicates an element about an axis. The axis can be a model line, symbolic line, reference plane, reference line or an edge of an extrusion. The selected element (or multiple elements) is copied and flipped to the other side of the clicked axis. Mirror - Draw Axis (DM): When this tool is chosen, the cursor functions similarly to a line tool. However, it draws an invisible line that acts as the mirror axis. After drawing the invisible line, the selected element is copied and flipped to the other side of the drawn axis. Split Element (SL): The Split Element tool is used to cut or split lines, arcs, circles and ellipses while in sketch mode. It can also be used to cut model lines, symbolic lines and reference lines. Split with Gap: This tool does not work in the family environment. Array (AR): This tool creates a duplicate or multiple instances of one or more selected elements. The duplicates can follow a linear or circular path. The number of instances and their locations relative to one another can be specified in the Options bar. There is also an option to group and associate selected elements that are being arrayed. Scale (RE): This tool resizes model, symbolic and reference lines. In Edit mode, it resizes profiles used in masking regions, filled regions, extrusions and split faces. The Options bar contains an option to scale an element graphically or numerically. Unpin (UP): This tool unpins or unlocks an element that has been locked by the pin tool. Pin (PN): This tool is used to lock an element in place. A pinned element cannot be moved or edited. Delete (DE): This tool removes a selected element from the drawing area. It is the equivalent of pressing the Delete key. Trim/Extend Multiple Elements: This tool trims or extends more than one element to a boundary. The boundary can be a model line, symbolic line, reference plane or reference line. It is also available in the sketch mode for extending or trimming lines and arcs. Trim/Extend Single Element: This tool trims or extends an instance of an element to a boundary. The boundary can be a model line, symbolic line, reference plane or reference line. It is also available in the sketch mode for extending or trimming an element to a boundary. Trim/Extend to Corner (TR): This button trims and extends elements to form a corner. It is also available in the sketch mode for extending or trimming lines and arcs to form a corner. Rotate (RO): This tool rotates one or more elements around a center point, which is the rotation axis. In plan, elevation and section views, the rotation axis is perpendicular to the view. In a 3D view, the rotation axis is perpendicular to the work plane. Copy (CO): This tool creates a duplicate of an element that can interactively be placed by dragging it to a desired location. The listening dimension can also be used to specify a specific distance. This copy function, however, does not store the element in the clipboard. Move (MV): With this tool, an element can be precisely or interactively moved to a desired location. The listening dimension can also be used to enter a specific distance. Knowing how the tools in the Draw panel work is necessary to modeling a component using any of the tools in the Forms panel (see Figure 15). Figure 15. The Forms panel tools. 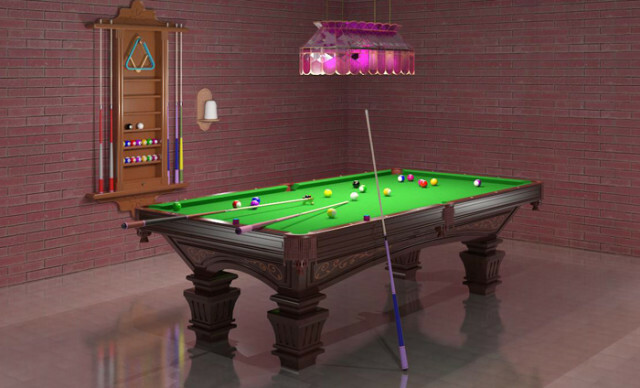 This, plus a good knowledge of the tools in the Modify panel, will enable you to create complex families such as the pool table shown in Figure 16. 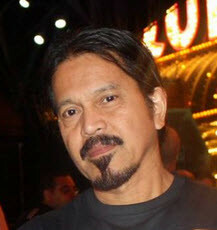 Michael Anonuevo currently works for YWS Design & Architecture located in Las Vegas, Nevada. He is a technical writer, BIM modeler and musician who owns and runs www.littledetailscount.com. Founded in 2009, his website specializes in unique and highly detailed Revit families created in native Autodesk Revit Architecture geometry. Anonuevo is an Autodesk Revit Architecture Certified Professional. He is also an Autodesk beta tester for Revit Architecture. At ClubRevit.com, he regularly writes articles pertaining to Revit families. He also writes product reviews and is a contributing author at AUGIWorld, AECbytes, CAD Digest, revitcommunity.com, and revitforum.org. He is a member of AUGI, Club Revit, the UK Revit Register, the Los Angeles Revit Users Group and the Southern California Revit Users Group.